Asking photographers to fork out nearly £800 for a compact/SLR hybrid may seem a high-stakes gamble in our tough economic times. After all, the same money will buy you a quality enthusiast D-SLR such as the Nikon D90 or Canon EOS 50D, or a very nice lens or tripod. So what's Panasonic's game plan? 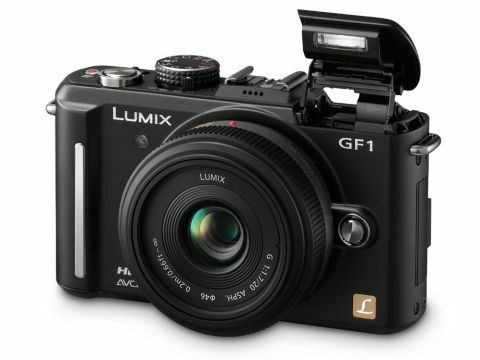 The idea behind the Lumix GF1 is to appeal to well-heeled compact fans looking for a nice upgrade that's still cheaper than a Leica, or SLR users seeking a more convenient back-up camera. Panasonic's also gambling on the sheer likeability of the Lumix GF1, particularly if, like our review sample, it comes with the wonderful 20mm pancake lens. With a maximum aperture of f/1.7, this fast, bright lens will be revelation to anyone who's only used cheaper, slower glass… We described the Lumix GF1 as a hybrid, but a more accurate description is mirrorless interchangeable lens camera – so it comes with a choice of lenses. This is possible because it's based on the Micro Four Thirds system. In essence, this technology enables smaller and lighter camera bodies and lenses by simplifying the convoluted optical path required by a conventional SLR. Instead, it incorporates an electronic viewfinder displaying live view (a real time representation of what the camera 'sees'). As such, the Lumix DMC-GF1 is a simplified version of the Panasonic Lumix DMC-G1, but lacks the high-end viewfinder and articulated screen. Panasonic must be cursing Olympus, as the new Pen addresses most of its predecessor's failings, namely sluggish AF, lack of built-in flash and lack of electronic viewfinder – the same weaknesses that the Lumix DMC-GF1 is designed to take advantage of. Panasonic is also facing a tough fight from the new Canon G11, a powerful, high-ISO muscle compact, hampered only by its bulk and conservative megapixel count. The GF1 is by no means a cheap camera, but it depends on your choice of lens. Buy it with the gorgeous 20mm f/1.7 lens, and the best price we could find was £712; opt for the inferior (but more flexible) 14-45mm zoom lens, and the price falls to £589. So a budget choice it ain't, particularly when you also have to pay extra to get the slot-in optional viewfinder.